Nia24 was created by Niadyne, Inc., a North-Carolina-based company that was founded by two professors at the University of Arizona's College of Pharmacy. These two professors, Myron and Elaine Jacobson, were researching Niacin and found that the result of Niacin on the skin was remarkable. DrSkinSpa.com is an Authorized Retailer of Nia24. All Products are Guaranteed Authentic & Fresh. If you've never heard of Nia24 then you may just be missing out on your secret to beautiful skin. Nia24 was created by Niadyne Inc., a North-Carolina-based company that was founded by two professors at the University of Arizona's College of Pharmacy. These two professors, Myron and Elaine Jacobson, were researching Niacin and found that the result of Niacin on the skin was remarkable. As a result, they founded Nia24, which utilizes Niacin in all its products. Both Myron and Elaine have over 25 years of biomedical research under their belts. Niacin is the secret behind the incredible benefits that Nia24 offers. It is formulated to strengthen the skin and prevent sun damage, while also reversing the signs of prior sun damage. 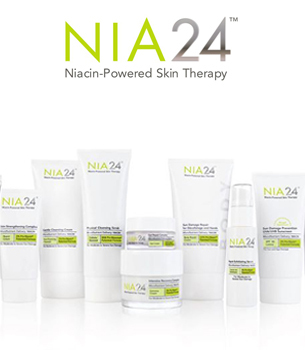 Some of the products in the Nia24 line include: a cleansing cream, a skin strengthening complex, an intensive recovery complex, and sunscreens. 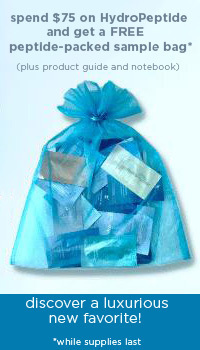 All of the products in the Nia24 line are fragrance free, color free and dye free. One of the products in the Nia24 line is a Skin Strengthening Complex, which is formulated to improve the elasticity and texture of the skin through the use of Vitamin A and a peptide complex called Dermaxyl. Dermaxyl has been found to reduce the appearance of fine lines and wrinkles by relaxing the muscles of the face. Unlike other beauty products, however, the products of Nia24 all contain Niacin. Niacin is a patented nutrient that serves as both a topical skin barrier and a skin builder. Niacin is a continuous-release nutrient that has been thoroughly tested and has been show to restore the skin's barrier and even reverse the signs of skin damage. Niacin is delivered through a MicroNutrient delivery system that releases Niacin, as well as several other beneficial nutrients, to the skin through a slow-release process. Niacin is formulated to address the skin through three course of action, including: pre-damage action, pro-active repair and an antidote for diagnosing the problems. As a result, Nia24 and its active ingredient, Niacin, has been show to prevent, repair and fight any signs of damage to the skin, to its deepest layers. Niacin is delivered deep into the epidermis of the skin, thereby encouraging DNA repair and repair of the skin's barrier. Although Nia24 are topical products, they are actually formulated to work deep into the skin's layers to repair skin damage of nearly every kind, from environmental damage to sun damage. Innovation in skincare results in beautiful, youthful skin, and Nia24 is an exemplary contributor to the preservation of glowing, radiant skin.